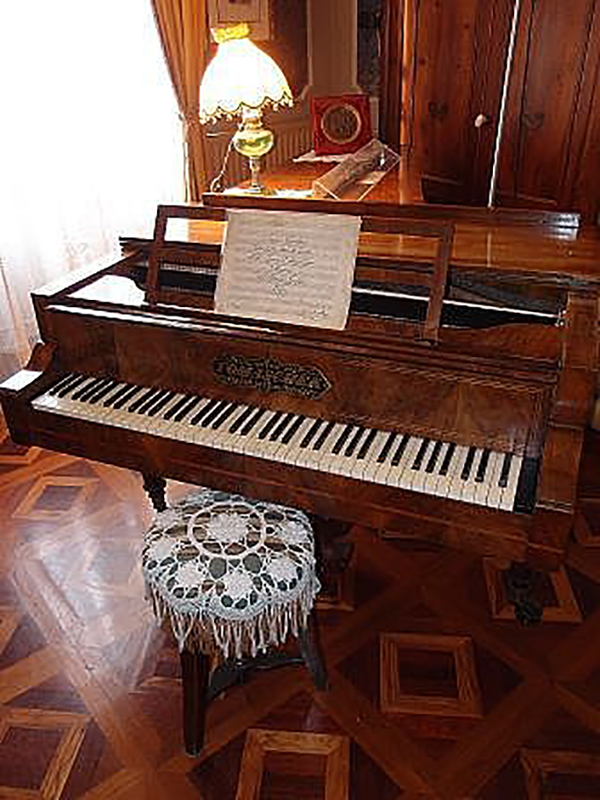 Antonio Barezzi, a wealthy merchant and a great music lover, glimpsed Giuseppe Verdi’s aptitude for music early on and asked him to his home as a music teacher for his daughter, Margherita. The first public appearance by the brilliant youth, in February of 1830, was in the salon, now called “Salone Barezzi” (Barezzi Salon), previously a seat of the Busseto Philharmonic Society founded by Barezzi and Maestro Ferdinando Provesi in 1816. 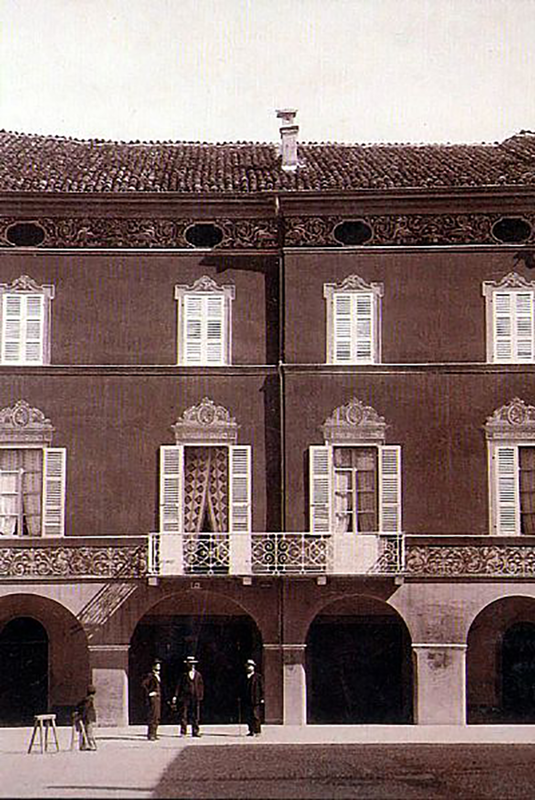 In the months leading up to his move to Milan (1832), where he was to complete his study of music privately under Maestro Lavigna, and after the disappointment of being rejected for admission to the prestigious Milan Conservatory, Verdi lived in the Barezzi home where little by little his friendship with Margherita ripened into love. His studies were financially supported not only by his father and a scholarship from the Monte di Pietà of Busseto (Pawnshop), but by Barezzi as well. Giuseppe Verdi was infinitely grateful to Barezzi as is shown in his numerous writings. 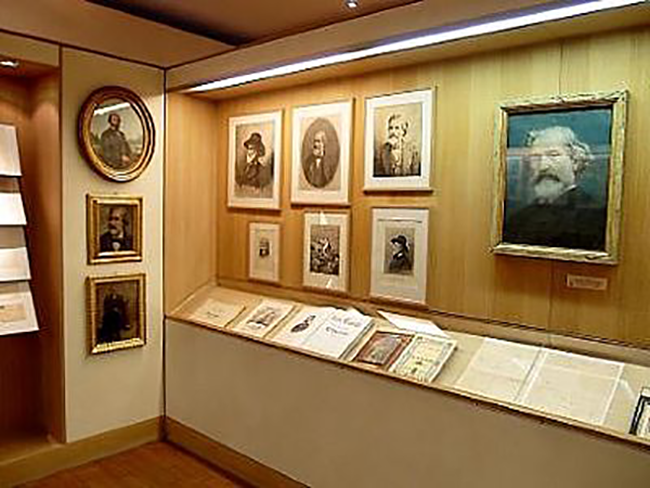 The Salon where concerts and conferences are held, appears to us today as it did in the late 1800s after restoration work carried out in 1979 and 1998 by the “Amici di Verdi” (Friends of Verdi) Association, which has its headquarters there. 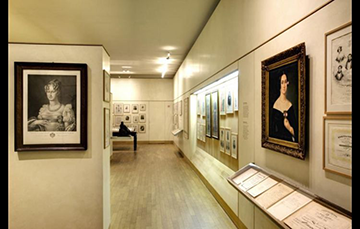 Here everything is redolent of the composer: the piano (which Maestro Riccardo Muti, an honorary citizen of Busseto, did not want to play out of respect for the sanctity of the relic), the portrait of Antonio Barezzi and the charcoal drawing of the young Verdi (most certainly the earliest image we have of him), autographed letters including the dedication of the opera Macbeth to his father in-law (1847) and some patriotic appeals (1859). A marble and bronze plaque on the front of the house commemorates Antonio Barezzi with the words dictated by Arrigo Boito in 1913. (guided tours 10.00 – 11.00 -12.00 am – 2.30 – 3.30 – 4.30 pm). (guided tour 10.00 – 11.00 -12.00 am – 2.30 – 3.30 – 4.30 pm). Open by reservation during the week at least one week prior to visit and after availability reconfirmation (min. 20 pax) – 339/4449414. On Carnival Sundays the museum will only open in the morning, in the case of suspension of the event it will be open with regular hours. The Museum is a privately owned: times may vary, it is advisable to always call in advance.